(Photo above from left to right: Program Manager Shepard Verbas, Director of Programs and Services Scott?Havelka, Executive Director?Judy Troilo)? June is celebrated as Pride Month to commemorate the?1969 Stonewall Riots, when the?LGBTQ community unified to oppose and fight back against oppression. According to the Stonewall Inn NYC’s website before 1969 the riots, it was illegal to serve gay people alcohol or for gays to dance with one another. When bars would get raided, women wearing less than three pieces of feminine clothing and those without I.D. or?dressed in drag were arrested, along with employees and management. Since then organizations like the LOFT LGBT Community Center in White Plains have fought to ensure the freedom and well being of their community on a?local level. 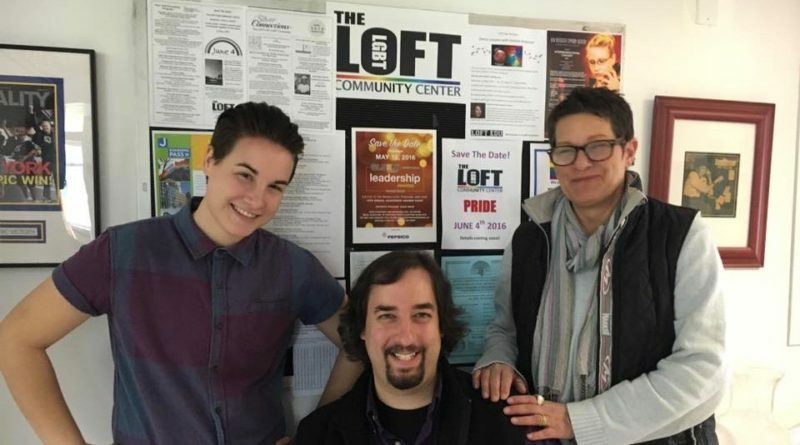 The LOFT has?been supporting the Lower Hudson Valley’s?LGBT community and its allies for more than three decades through its programming and by advocating and education. ?The LOFT acts as?a support system for the LGBT community by connecting them with?programming, services and referrals. You can call their helpline at (914) 948-2932 ext. 14 or email at??info@loftgaycenter.org. The LOFT also organizes fun activities and events like hiking and kayaking trips; and entertainment, movie and game nights. The LOFT Pride event is on June 4 from?noon to 5 p.m. at?252 Bryant Ave. in White Plains. The LOFT has a variety of target programming including, a mental health group; a 55+ group and senior outreach program; a group for transgender young adults; yoga lessons; the Lesbian Social Network; a writers club; book clubs; and other offerings. They also partner with CenterLane?to provider services to teens. Verbas explained the importance of having a separate group for transgender individuals and those who are gender non-conforming since they deal with very different issues. Sometimes the needs of specific individuals can get lost in translation when people are grouped together. “We help get?people get what they need, which is specific to their experience, including barriers they encounter everyday, things they want to celebrate, or how they want to be understood,” said Troilo. The LOFT also has a group for families. LOFT Family group?is a networking group for LGBT parents and children that offers open houses, trips, a newsletter, playdates and a carnival. They meet once a month on the last Saturday of the month. The LOFT’s pro-bono name change project, legal clinic, gift shop, amazing library and computer center and other services are all run or donated?by volunteers.